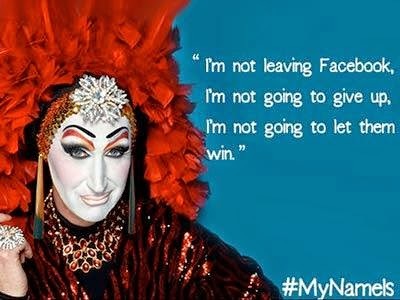 After meeting today with drag queens, transgender people, and other LGBT and allied users concerned about Facebook's policy requiring users to be listed under their "real name," an officer with the social networking giant has apologized for the policy and offered a clarification. "I want to apologize to the affected community of drag queens, drag kings, transgender, and extensive community of our friends, neighbors, and members of the LGBT community for the hardship that we've put you through in dealing with your Facebook accounts over the past few weeks," wrote chief product officer Chris Cox in a Facebook post this afternoon. "Our policy has never been to require everyone on Facebook to use their legal name. The spirit of our policy is that everyone on Facebook uses the authentic name they use in real life. For Sister Roma, that's Sister Roma. For Lil Miss Hot Mess, that's Lil Miss Hot Mess. Part of what's been so difficult about this conversation is that we support both of these individuals, and so many others affected by this, completely and utterly in how they use Facebook." EVENT: Fresno Pride Lions Halloween Spectacular!